Behind Junior Walling’s 223 yards rushing and four touchdowns, the Celtics defeated West Salem 35-23 last Friday to improve to 3-0 in the Mountain Valley Conference. Like any good running back, Walling credited the offensive line. Senior Wyatt Sherwood returned to the line after missing five games with a concussion. Wearing a new number, 38, Sherwood also lined up at tight end, catching three passes for 44 yards. McNary jumped out to a 14-0 lead at West Salem on two touchdown runs by Walling. But the Titans answered with 10 points at the end of the first half on a 6-yard touchdown run by quarterback Simon Thompson and then a 32-yard field goal by Kyla Gordon with the clock expired after West Salem got an extra play thanks to a defensive holding penalty on McNary. The Titans then took the lead when Thompson connected with Anthony Gould for a 33-yard touchdown just 20 seconds into the third quarter. But West Salem’s lead didn’t last long as Walling broke loose down the McNary sideline for a 42-yard touchdown run to put the Celtics back on top, 21-17, with 10:30 remaining in the third quarter. 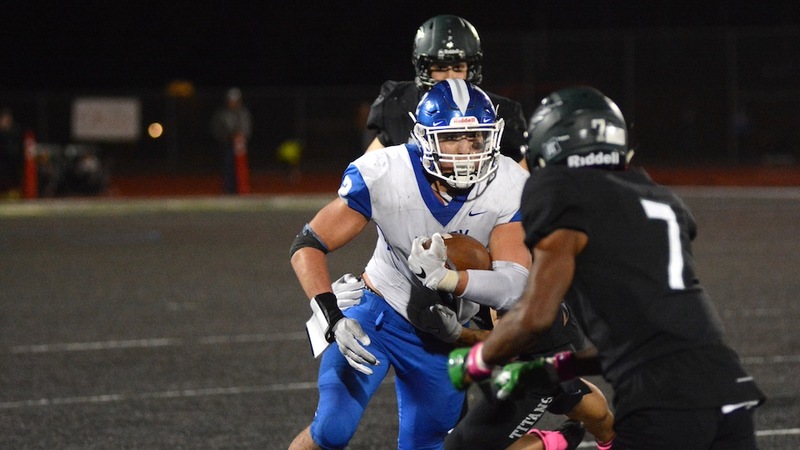 After Jacob Jackson added a 5-yard touchdown run to extend McNary’s lead to 28-17, the Titans needed only one play to answer as Gould took a reverse 45 yards to get West Salem within 28-23 entering the fourth quarter. But McNary’s defense shut out West Salem in the final 12 minutes and Walling scored his fourth touchdown with 2:23 remaining. Jackson then intercepted Thompson with 2:01 remaining to seal the victory. Thompson completed just 12 of 35 pass attempts for 275 yards. Gould caught four passes for 78 yards. Gould predicted six touchdowns on Twitter, which McNary’s defense was well aware of. West Salem tight end Micah Pugh caught six passes for 144 yards. Barker completed 11 of 19 passes for 156 yards and also rushed for 62 yards. The Celtics close the regular season this Friday at home against South Salem with a chance to win the conference championship. Anyone with an interest in how Keizer grows – and what it will cost in terms of dollars and livability – should mark their calendars for a city council work session slated Monday, Oct. 22. From 6 to 8 p.m., the council and members of the audience will have the opportunity to discuss with consultants the findings of a report on what the city’s residents want out of growth and what they should expect in terms of costs. The final draft of the report, which is available online at www.keizer.org, presents a daunting picture of what it would take for Keizer to grow and the repercussions if it does. Through the study and report, city officials and staff are wrestling with the challenges presented in a 2013 Housing Needs Analysis adopted by the city. That analysis concluded that Keizer would fall short of the land needed to accommodate expected growth for the next 20 years – to the tune of 1,674 residential units or 197 acres. To annex additional land, Keizer would either have tofind a way to work with Salem to expand the shared Urban Growth Boundary (UGB) or seek to separate the boundary through existing processes or legislative intervention. Either scenario is something of a hard sell because Salem has enough available land to accommodate expected growth in both cities for the next 20 years. While Keizer is technically responsible for providing enough housing to accommodate expected growth, the shared UGB might give it a way out if state officials ever decided to press the matter. “The shared land supply with Salem means that Keizer is not on the hook to make new lands available,” the study concludes. The 34-page report is chock full of relevant information, some of which has been discussed in previous editions of the Keizertimes. The newest sections include a look at additional burdens Keizer citizens would have to carry or pay for if it pursues a UGB expansion. Water systems would need to be expanded into annexed areas and upgrades to current equipment might be required to handle additional volume. Some of this cost could be recouped through system development charges paid by developers, but not all of it. Developers would construct new roads through annexed areas, but the city would be required to reimburse them for that portion of development and commit to long-term maintenance. Existing intersections and arterials might also need to be upgraded to support additional traffic. Another consideration is access to public transit. The areas where Keizer could most easily expand are also relatively remote from the city core, likely on 30-60 minute bus routes. Those costs would be shouldered by Cherriots, which is already competing for limited state and federal funding. Given the prospect of inconvenience, residents in the annexed areas would be more likely to rely on cars and add to existing traffic. Keizer’s police department and fire district would likely feel a strain on services preceding a a need for new funding. Additionally, annexed areas would be the furtherest from either agency’s headquarters. While new property taxes might contribute to paying for additional services, Keizer’s low tax rate is not likely to cover the expected need. Funding for schools is provided by the Salem-Keizer School District, but if the Keizer expands to the north, it could mean shifting students who live in south Keizer to North Salem or McKay high schools and other interruptions in the current feeder system.